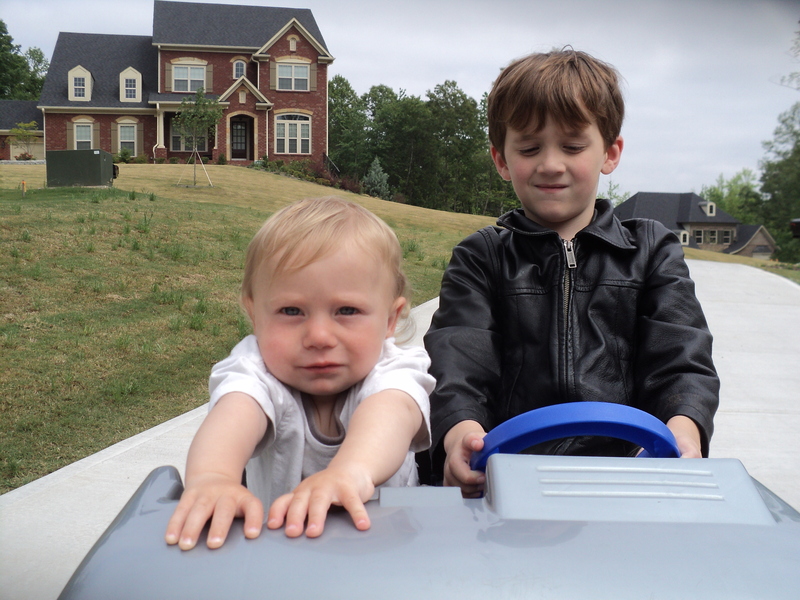 Hugo and his cousin Connor are the new Dukes of Hazzard. I went to Georgia to visit with my brother and his family last week. I got to meet my precious new niece and spend some quality time with family. But it was stressful to be away from all the stuff that needed to be packed. Hugo and I went by ourselves and he was very well behaved on the plane again. Didn’t sleep as much as last time, but we were armed with a few episodes of Chuggington on an iPod. Hugo was uncharacteristically discreet with nursing on the plane and was content to stay in the sling as we made our way through the airports. Now the cabinets full of glasses, medicine cabinet full of expired sunblock and bins of toys are steadily turning into boxes. I’m excited about the new place. The same week we found out that our new home was earthquake ready, we have to pack up and flee for higher ground when hurricane Irene hits this weekend. The Highlands has mandated evacuations by 5:00 PM tomorrow. Fortunately, we have friends inland who are taking us in – guinea pig, cat and all. I was nervous about packing this evening, but I feel better now that I have tupperwares of pet food ready to go. Hugo will have fun playing with his lovely two year old girlfriend and Maggie the pig seems to enjoy traveling and a change of scenery. I think the cat will have the most difficult time. Our friends have six cats. Stash has never been around another cat, other than to hiss through the window. I hope everything about this charming town is intact when we come back! I just read that there is a curfew from Saturday at 8:00 PM to Monday at 9:00 AM. It will be good to be at a hurricane party that originated as a two-year-old birthday. It’s easier to laugh away your fears with good company. I could have mentally railed about moving a block from the beach a week before the biggest storm of my lifetime hits New Jersey, but it turned out that the town we moved from is also being evacuated. I wonder if the boxes we have left there will stay dry. Hugo just started napping well in this new house today! Oh, well. Maybe he’ll sleep even better after we get home (on Monday?). I hope we have power. Best of luck and God bless everyone who is in the path of Irene. We moved this week, about 10 miles east to a cute, sunny duplex in the Highlands. The last time we moved I was eight months pregnant and I thought that was hard. This time, it’s been eight months since I gave birth to Mr. Go. What a different experience! Last year, I was only able to take a couple of days off of work. I had no energy to pack when I got home and waddled up the stairs to our apartment. My husband ended up doing all the packing and unpacking when we moved only a week before my baby shower when several relatives were coming to visit. This time, I had plenty of energy and very little opportunity. It was a bit frustrating to be able to see what I want to do and then the reality of having a cruising Hugo set in and it all got put off. I was starting to panic a bit when it seemed like nothing was getting done all the way up to the Friday before moving Monday. Very, very lucky for us, my mom came to stay with us and help. She lives in Scottsdale and I always enjoy the alternate reality of child rearing when she comes to visit! Hugo’s not too receptive about other people taking care of him. He protests if anyone who isn’t me tries to put him down for a nap or the night and has a dose of separation anxiety as well. My mom was undaunted this time and she and Hugo are now special friends. That makes me so happy. We alternated packing and Go duty. It was pretty close – let’s just say I was glad the movers arrived at 9:15 instead of 8:00 Monday morning. 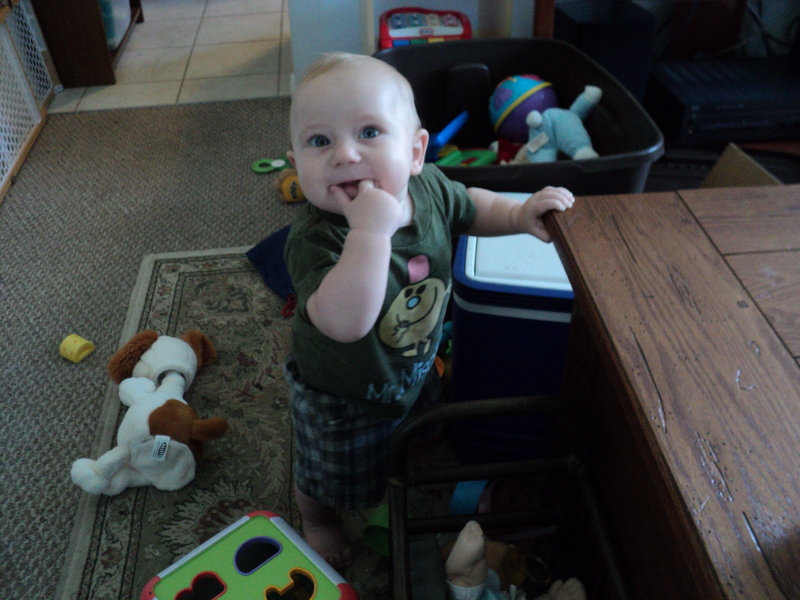 It all went smoothly, even when Hugo needed to eat lunch on the coffee table since that was the only furniture left. He was so good. He had to ride back and forth between the houses a few times and didn’t melt down once. While my father and husband worked on cutting up the box spring so that it would fit upstairs, my mom and I managed to go back to the house to take stuff bound for storage down from the attic for a half hour while he napped in his car seat. Hugo woke up just in time – my back had had enough. There’s no room in the new place for baby jail. It’s been interesting trying to make safe places for Hugo to play. There is too much furniture in here right now. We need to do some rearranging that includes moving one of the couches out to the porch. It’s been easy for Hugo to cruise from piece to piece, but he also whacked his head several times trying to navigate. Rick’s working at the coffee table instead of a desk, which is irresistible to Mr. Go. He grabs remotes, papers, wires, anything he can reach. I caught him scaling a barrier I put up today by standing on a cube shaped toy and climbing onto the coffee table. Boxes of books make great baby barriers. He did walk yesterday – I am so proud! He took several steps a few times but today was back to tentative cruising. I don’t know if it’s the novelty, but so far Hugo has been so cooperative about coming to the laundromat with me. We’ve been there three times this week as I get acclimated to the logistics of walking over to the corner with Hugo, clothes and detergent. We’ve been able to bring Hugo to the little beach two blocks away most days. 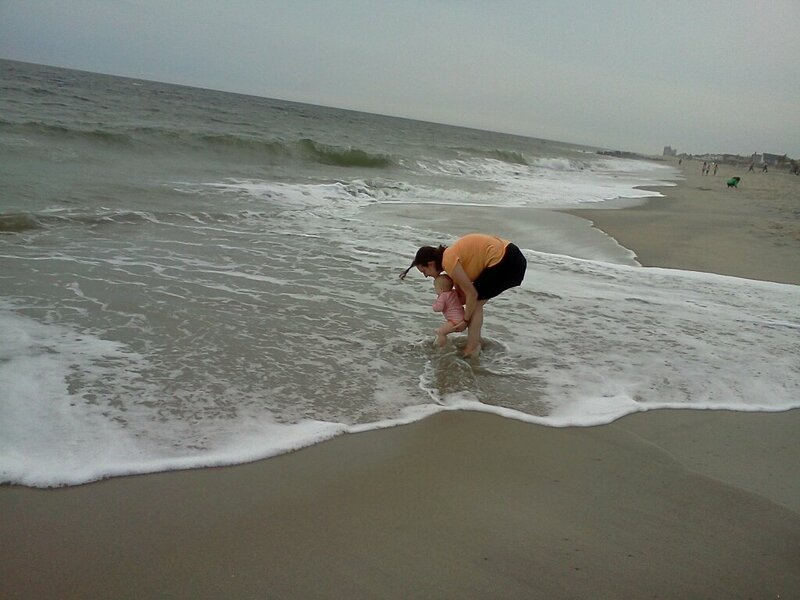 He loves kicking his feet in the waves and I love to see the look of joy on his face. I feel very lucky. Even with plenty of energy, I haven’t been able to do much after Hugo’s in bed for the night. His bedtime is later now – around 8:00. After eating dinner and cleaning up I’m ready for bed myself. We’ve been here almost a week and Hugo’s been on a 3 nap schedule. He wasn’t sleeping too well before the move and now his naps are short and he wakes up completely in the middle of the night most nights. I know it will pass, just hope it’s soon!